This article is the result of some very interesting discussions below a recent TEC article on the potential of coal, nuclear and wind/solar to supply the rapidly growing energy needs of the developing world. In that article, I estimated that nuclear is roughly an order of magnitude less scalable than coal, but more than double as scalable as wind/solar. These estimations were challenged by both nuclear and wind advocates and, as such critical discussions often do, have prompted much closer investigations into this issue. In particular, data pertaining to the near-term prospects of nuclear energy in China, the nation accounting for fully 43% of nuclear plants currently under construction, has been analysed in more detail. The results of this analysis confirmed my estimations above fairly well, but only under two very important assumptions: 1) that all the nuclear plants currently under construction in China are successfully completed roughly 6 years after construction commenced and 2) that it will be a very long time before we experience another black swan event like Fukushima. China has invested heavily in nuclear energy over the past few years, leading to a rapid increase in construction activities. Data from the World Nuclear Association has allowed for the creation of the following plot of started and completed nuclear reactor capacity in China. 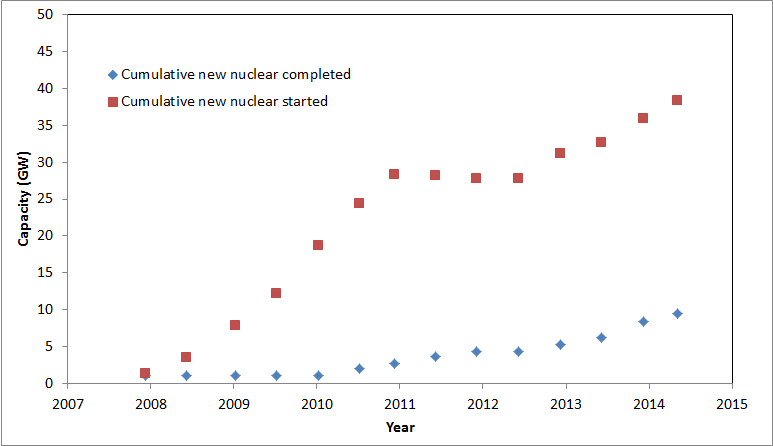 Note that the plot shows the cumulative started and completed nuclear capacity from the start of 2007. The graph shows a rapid increase in new nuclear construction projects from 2008 onwards when alternative energy investment really started to take off. In addition, a clear 18-month pause in new construction projects is visible starting from 2011, indicating the substantial impact of the Fukushima disaster on Chinese nuclear growth. However, the graph shows that new nuclear construction starts resumed an upwards trend from middle 2012, albeit significantly less aggressively than before Fukushima. As can be expected, nuclear plant completions show a long time-lag relative to nuclear plant starts. Nuclear plant construction generally takes 4-6 years in China, but the trends in the graph suggest that the reality might lie towards the upper end of this range. In the event that a 6 year construction time is generally representative, it would seem that we are currently on the cusp of a rapid nuclear growth phase in China. Thus, if the next 2-3 years reveal that the blue curve above is essentially a 6-year time-shift of the red curve, it will bode well for the future of nuclear energy. If not, however, nuclear prospects would appear substantially dimmer, at least in the medium term. It will therefore be very interesting to extend this graph with real-world data over the next couple of years. Wind power has also been growing rapidly in China since 2008. The relative simplicity and modular nature of wind causes much shorter construction times than nuclear, and has therefore led to a much more immediate impact. However, the true scalability of a technology must be tested over substantially longer time periods than the 6 year nuclear construction period, implying that this time-lag is not highly relevant when considering the longer-term energy future of China. Under the assumption that wind construction times are essentially negligible, we can therefore compare the rate at which new investments are made in wind and nuclear energy. To make this comparison, one also has to take into account the difference in capacity factors between wind and nuclear energy. This is a rather sensitive area, but I will use data from the BP Statistical Review and the World Nuclear Association to make a reasonable estimate. At the end of 2013, China had 15 GW of operational nuclear and 91 GW of operational wind. In terms of generation, nuclear delivered 110.6 TWh and wind 131.9 TWh. This implies that one unit of nuclear capacity delivers about 5 times as much electricity as one unit of wind capacity. This might be an over-estimate, however, since China is working hard to solve significant wind curtailment problems at present. I will therefore use a ratio of 4 in this analysis. Using these assumptions, the Chinese wind capacity buildout is compared against the Chinese nuclear construction starts in the graph below (note that wind capacity is divided by 4 in order to reflect actual electricity generation relative to nuclear). Similar to the graph above, numbers are presented from a base of 0 at the start of 2007. It is shown that new nuclear projects were started at a tempo more than double the rate at which wind projects were competed before Fukushima and roughly at an equal rate when nuclear starts eventually recovered thereafter. This is a clear indication of the impact of a black swan event on the prospects of nuclear power, even in China. Thus, it can be theorized that nuclear scales roughly twice as fast as wind under normal circumstances, but at an equal rate when a recent black swan event burdens the industry with additional regulations. It should also be mentioned that the Chinese tariff system favours wind over nuclear by paying a fixed feed-in tariff of $83-100/MWh to wind and $70/MWh to nuclear. Another important factor to consider is the reduced value of wind relative to nuclear due to the variability of wind power (see my previous articles on this subject here and here). Wind power also requires expensive high voltage transmission networks to transport power from good wind locations to population centres, something which is creating substantial challenges. Thus, if the playing field were to be leveled, the difference between nuclear and wind scaling rates should increase substantially. If all nuclear plants currently under construction are successfully completed, China may well lead a much needed revival in nuclear energy. However, it is important to keep things in perspective by comparing to the rate at which fossil fuels like coal have scaled to fuel the economic miracle that took place in China over the past decade or two. In order to compare the scaling rates of nuclear and coal, projected nuclear power (under the assumption that all plants under construction are successfully completed) has been converted to primary energy using a capacity factor of 90% and a typical thermal plant efficiency of 40%. 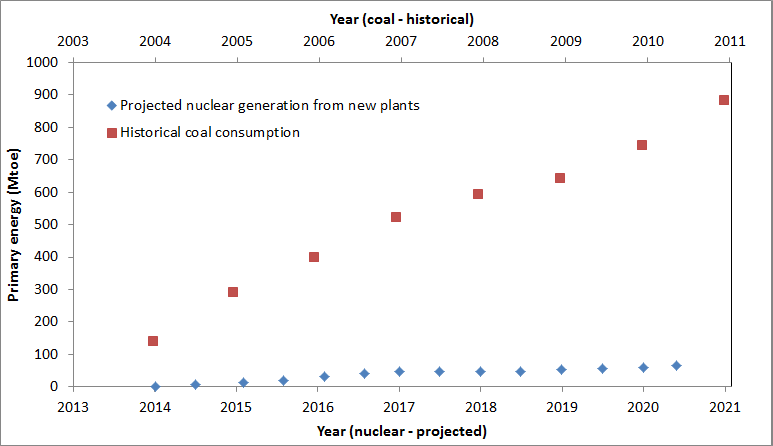 The graph below compares the potential scaling rates by comparing the projected increase in primary energy from nuclear over the next 6 years to the increase in primary energy from coal one decade ago. The graph is plotted from a base of 0 in 2013 for nuclear and 2003 for coal. The graph shows that nuclear is projected to scale a little over an order of magnitude slower than coal did one decade ago before the impact of Fukushima and still slower thereafter. This result is especially significant given the fact that the Chinese economy more than doubles in size every decade. This implies that the Chinese economy is about double as capable of adding energy capacity today as it was in 2003.